Today marks the 164th anniversary of the mysterious death of Edgar Allan Poe. Born in Boston in 1809, Poe died in Baltimore on October 7, 1849. A former resident of that city, he was only passing through on his way home to New York (he lived in the Bronx near Fordham University) when he was found "rather the worse for wear" and "in great distress." 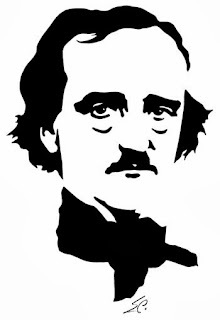 Poe appeared not to have bathed in some time; his hair was dirty; his eyes were "vacant." He was wearing an ill-fitting suit--maybe it wasn't even his own. What had happened to him? But while you wait for the book to come out, you can go up to the Morgan Library & Museum to check out their new Poe exhibition, "Edgar Allan Poe: Terror of the Soul," which opened this past Friday and runs until January 26, 2014. Also interesting: today's installment of the "Page-turner" at The New Yorker, which investigates whether some stories attributed to Poe's brother, Henry, are actually by Edgar himself.